Traveling with young children can present a unique set of challenges that other travelers may not face. One of the top concerns of parents traveling with young children is understanding car seat laws. Along with this comes the challenge of lugging a travel booster seat around from destination to destination. Until recently, this was a struggle that had no viable solutions. However, with the introduction of the smallest, safety-certified portable travel booster car seat on the market the MiFold Portable Car Seat has completely changed that family travel scene. What is the MiFold Portable Car Seat? The MiFold booster is a small, ultra-compact portable booster seat. And by small, I mean that this foldable car seat can fit inside an adult’s back pocket. The MiFold car seat is marketed as a grab-and-go booster seat for children, and on all accounts, it is a perfectly accurate statement. It is tiny, lightweight, and quick to install. And all of these things put together make it attractive as an ideal booster seat for travel. But does this foldable car seat live up to the hype? Using car seats for travel can be a frustrating experience. Oftentimes they are large, bulky, heavy, and just plain awkward. Because of this, many parents simply leave them at home. This can be even more common when traveling to countries with no, or lax seatbelt laws. We have traveled with car seats to Mexico, Portugal, and Iceland. And while it was incredible having our car seats available, the stress of traveling internationally with something so large in addition to all the other family travel gear that we carry can be difficult. There have been times abroad when we have been on the road and haven’t had car seats available. In both Colombia and Grenada, we were in situations where we didn’t have a car seat available to us, and we had to travel without car seats. While this can be part of travel, it also ups the risk and stress of travel with children. How Does the MiFold Work? The design of the MiFold foldable booster car seat is clean, tight, and well thought out. But the real ingenuity of the product lies in it’s unique approach to the child’s position. Because most car seat belts are designed with adults in mind, most car seats focus on raising the child up to the safe height of the seatbelt. 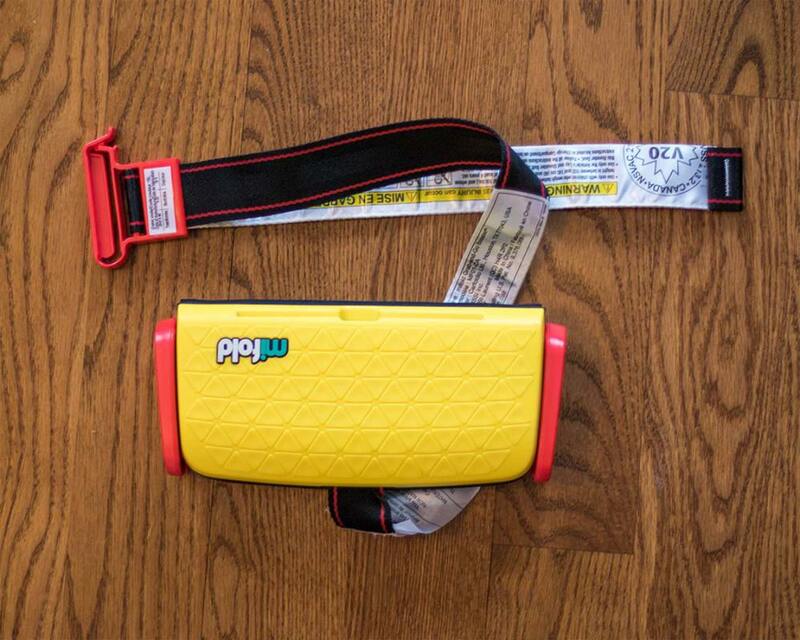 This creates the connection necessary to keep the child safe when the belt locks. The MiFold portable car seat, however, takes a different approach to car seat safety. 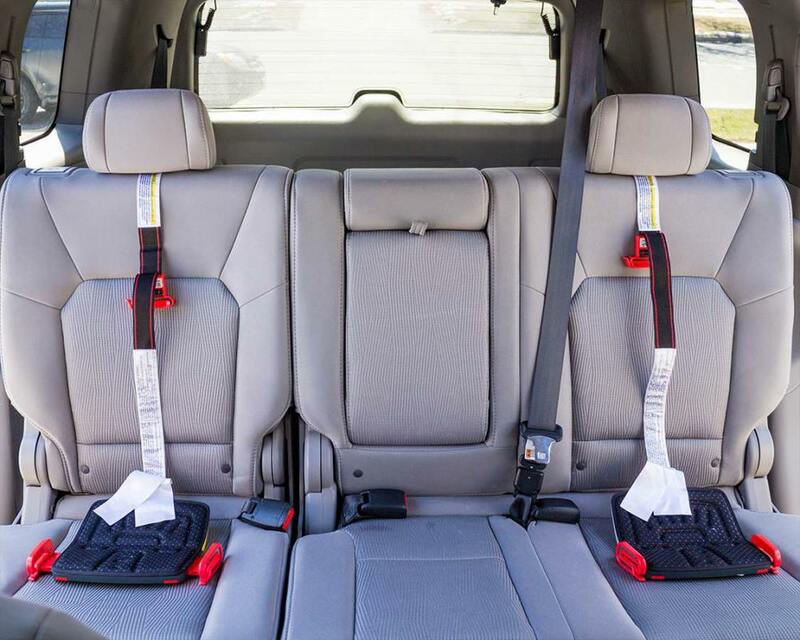 The MiFold is designed to lock the seatbelt height down at the level of the child. Essentially pulling the seat belt into the place of the child rather than lifting the child up. This allows the seat belt to be adjusted to the size of the child without affecting its functionality. The MiFold can be set up in about a minute. There are two buttons on either side of the bottom-front of the unit that unlock the two sliding latches on each side of the MiFold booster. This allows the foldable car seat to be adjusted to the width of the user. At the back of the foldable booster seat for travel is a long strap that can be hooked onto the shoulder belt of the seat belt. There is a small latch on the shoulder hook that allows the strap length to be adjusted so that the shoulder belt can be pulled down to the proper height for the child. There have been comments that the MiFold can latch the belt too low on the legs or hip of the child. The lap belt should fit flat and snugly across the hip and upper legs. While we haven’t experienced this ourselves, it is important to make sure that the car seat is positioned properly for maximum safety and comfort. The MiFold eliminates the risk of not traveling with a car seat. The unit is so small, that our children can easily carry it themselves in their day pack. The only time we have ever been in a situation where we haven’t been able to use the foldable booster seat was when the cars just didn’t have seatbelts. And having that kind of security in such a small, easy to manage package is amazing. The most direct competitor to the MiFold is the Bubblebum, which is an inflatable car seat. However, even when the Bubblebum car seat is deflated, the MiFold still looks small in comparison. The MiFold booster seat eliminates the stress of bringing a car seat on a plane. However, it isn’t perfect. The portable car seat doesn’t have the side impact protection that larger, more robust car seats have. There is no head protection, no cup holders, no pockets. This unit is a no-frills car seat with one thing in mind. Portability. And the MiFold does portability like no other car seat on the market. The MiFold is also not the most comfortable car seat on the market. It does have padding, which is appreciated. But for long road trips, the MiFold could leave bums a little numb. The MiFold might be the best car seat for travel, however, it doesn’t replace a standard, full-back car seat for everyday use. Can the MiFold Booster Seat Be Used for Travel? Car seat laws vary from country to country. They can even vary between provinces and states within any given country as well. While the MiFold car seat is designed to comply with the laws in most countries, it is important to read the car seat laws before you travel to a destination. You can read the AAA guide on car seats in the United States here and the Canadian car seat guide here. It is also important to note that proper installation is just as important as choosing the right car seat. If a travel booster isn’t installed correctly, it may not be safe.